Juan Gelman is arguably Argentina's greatest living poet. Now 83, he has published during the course of his career nearly two dozen books of poetry. He won the Cervantes Prize in 2007, the highest honor in Spanish literature, awarded by the Ministry of Culture of Spain. With a profoundly tender and human voice of colloquial speech/tone mixed with great verbal invention, Gelman's poetry celebrates life and also engages in the political struggle of his homeland. That struggle, which played out in Argentina's Dirty War of the 1970s, took a huge toll on his own personal life. Yet, despite the tragedy of this war that he endured—and still suffers—he offers us a remarkable body of poetry. He marries justice to beauty with great courage and artistry. There could hardly be a better introduction to Gelman than Hardie St. Martin's translations of his poems chosen for Dark Times Filled with Light, starting with work from his first book published in 1956, and moving through subsequent books up to his poetry published in the early 1990s. The translations are very accurate. They are so good, in fact, that the poems here seem to have been originally written in English. It may come as a surprise that Gelman has yet to receive the attention he deserves in the United States, for he is a world-class poet and great innovator of language, whose poetry not only fits quite naturally in our own literature but also expands its bounds, forcing English to do new things. Indeed, Gelman's poetry in translation extends the range and capacity of our own speech, poetic art, and sensibility. For this treasure of a book we must thank not only Gelman and St. Martin, but the poet Paul Pines, who, following St. Martin's death in 2007 at the age of 83, tirelessly worked at finding the manuscript a good publisher. While St. Martin was still alive, it had been accepted in the 1990s for publication by the now-defunct Curbstone Press, but due to a variety of circumstances called bad luck, that didn't happen. Pines became the book's champion. His introductory essay in the book adds greatly to its value. He prepares the reader in a clear and concise way for Gelman's poems that, as Pines put it at a recent gathering of translators, "embody the ability of the human spirit to transform unspeakable challenges into an affirmation of humanity." Considered one of the masters of translation from the Spanish, St. Martin translated Pablo Neruda's Memoirs, José Donoso's Obscene Bird of Night, and collections by Miguel Hernández and Blas de Otero. He put together the critically acclaimed anthology, Roots and Wings: Poetry from Spain 1900-1975 (Harper & Row), which won the first Islands and Continents Translation Award (bestowed by Robert Bly, Donald Hall, and Gary Snyder, among others), and the selected poems of Roque Dalton, Small Hours of the Night (Curbstone), the first work in Spanish to win the American Literary Translators Association's Outstanding Translation-of-the-Year Award. the oneness looked for like manna from heaven? the unity sought out like a sky-blue delight? one can at last find unity like heavenly manna? The immediate differences in these versions, compared with St. Martin's Gelman, are in the word choices, cadences, imagery, and tone. In fact, the poet seems to have three different voices in English. Which one is truest to Gelman? That's the big question. St. Martin approached translating Gelman's poetry with a keen understanding of his voice in Spanish and the task of the translator who must recreate it in English. In a set of notes for a planned introduction to his would-be book, he says: "The flexibility of the Spanish language—inflective—allows Gelman to play with it ... Purists may object to some of his inventions but his words say what he wants to say the way he wants to say it ... Complex under a simple surface that hides much we have to dig out ... The translator has to reshape many words & give them to the English language." Pines responds: "Suffering burns away excess, and that is why Gelman's affinity with San Juan de la Cruz and their shared experience of the soul's dark night produces in both a minimal, almost skeletal use of language. Gelman, after the mystic, calls it discalced (barefoot). There is in Hardie's translation [of "commentary I (saint theresa)"] no genitive's of possession, intricate syntax, flowery adjectival descriptions, repetitions that are soft or romanticized. The ability to render Gelman, his complex emotional/psychological tensions, in English with the same compression and spareness is the miracle in Dark Times, and why I found it so moving." The fact of the matter is, every translation of a poem is written twice, first by the poet, then by the translator. Totally bilingual in Spanish and English, and also possessing intimate knowledge of contemporary poetry in both Latin America and the United States, Hardie St. Martin translated Gelman with the highest degree of poetic skill and soulfulness. 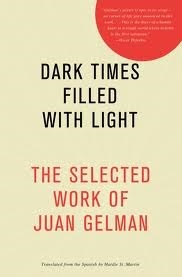 Consequently, the fusion of two great writers is found in Dark Times Filled with Light, and this book is where to begin reading Gelman in English—for the appreciation of his growth as a poet over the first four decades of his work, and for the translator's recreation of its beauty and vision.